Brown ground meat and drain. Press draining beef to remove excess fat. After draining ground beef, continue cooking. Add onions and sauté for about two minutes or until onion is tender. Add Southwest spice blend, garlic powder, cumin seed, and salt. Blend well, then bring to a simmer. Add tomato paste and lemon juice to meat mixture, blend, and cook until mixture turns dark red. Add water and bring to a simmer and cook for 25-30 minutes. Stir occasionally to prevent sticking. Dice tomatoes and combine with lettuce, toss lightly, and portion 1/2 cup in portion container. Combine cheeses and portion 1/2 ounce of cheese in portion container. Portion 1 ounce of salsa in portion container. Before serving or on serving line, fill each tortilla with #20 scoop meat mixture. 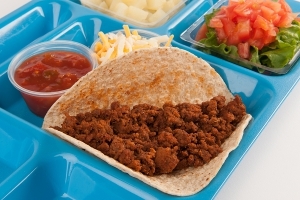 Serve preportioned lettuce and tomato mixture salsa, and 1/2 ounce cheese on the side with meat-filled tortillas. Instruct students to "build" their own tacos. 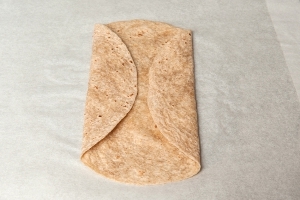 Tortillas can also be folded into a "pocket". 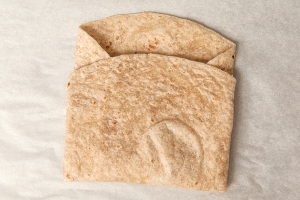 Pictures 2 through 5 demonstrate the steps to assemble a "pocket" tortilla. Portion 1 taco with trimmings per serving. Each portion provides 2 oz. eq. meat/meat alternate, 1 oz. eq. of enriched grain, 1/4 cup of red/orange vegetable, and 1/4 cup other vegetable. 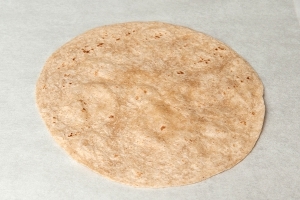 To assemble a "pocket" tortilla, lay tortilla on a flat surface. 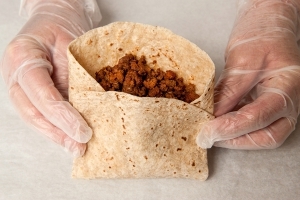 Stuff the "pocket" with filling (such as taco meat). These can be stack up in a half size sheet pans for easy service.